Does polarization pave the way for establishing a pluralistic system? or is it merely the prelude to power struggles? During the past four years, the Middle East and North Africa, in particular the countries experiencing what is known as the “Arab Spring,” have followed very different paths in the process of transitioning from authoritarian rule to regimes more closely representing the will of the people. The Tunisian experience in the four years following “the revolution of freedom and dignity” has been marked by seismic political and social developments, making it a subject of constant interest to observers and political analysts of the “Arab Spring” seeking to understand the causes underlying the peacefulness of the Tunisian transition. 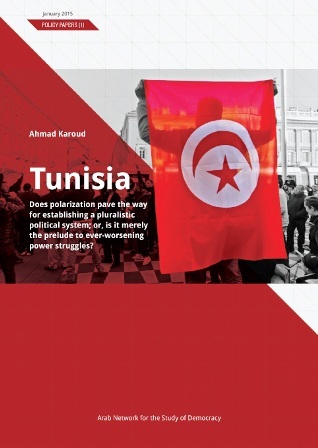 This paper attempts to analyze the most significant developments in Tunisia in recent years, focusing on the phenomenon of severe political polarization that has dominated the various stages of the transition from decades of authoritarian rule to a nascent political regime based on the will of the people and rooted in free and democratic elections. This paper also presents likely scenarios for the near future, as Tunisian politics moves past the foundational stage, which was concerned with drafting a new constitution and electing the legislature and executive. Translated to English by Jeffrey D. Reger.